Every Techlam product is manufactured strictly in accordance with NZ standards and is produced at our Levin plant under a robust Total Quality Management system. Techlam complies with the AsureQuality PINENZ Certification Programme and is audited regularly to ensure continuing compliance to these standards. Our team holds as a minimum a Level 3 qualification in Competitive/Lean Manufacturing (CMI), which gives us the ability to respond quickly and accurately to market demands, while giving you confidence that you buying the best quality glulam. • AS 5068:2006 – Timber – Finger Joints in structural products – Performance and production requirements. • AS/NZS 1328.1:1998 Glued laminated Structural Timber – Part 1 Performance requirements and minimum production requirements. • AS/NZS 1328.2:1998 Glued laminated structural timber – Part 2 Guidelines for ASNZS 1328 – Part 1 for the selection, production and installation of glued laminated structural timber. Packets of rough sawn, kiln dried timber are loaded into our defecting line where the operator visually grades the sawn timber as it is released onto the rollers. This involves marking defects in the timber with a fluorescent crayon. 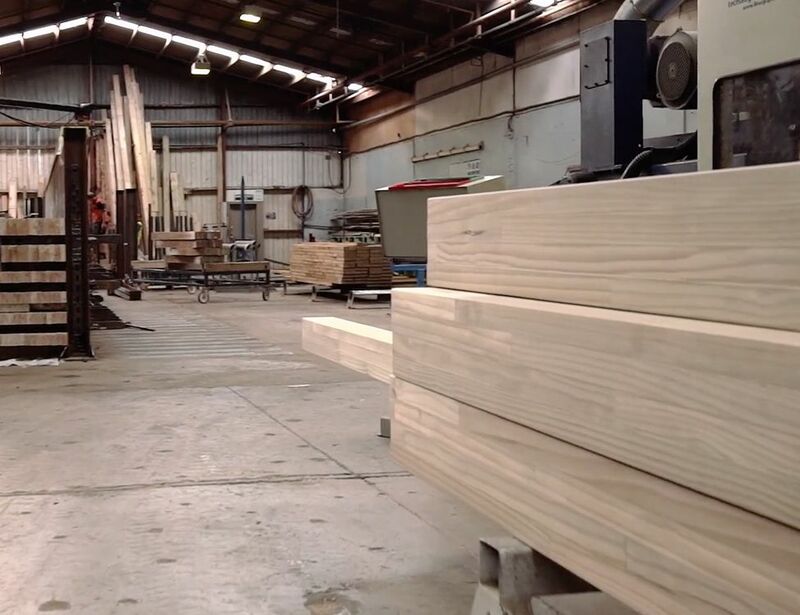 Once defects are marked, the pieces of timber are carried through the defecting line, which recognises the marks and automatically removes the defects. The remaining pieces of timber (lengths vary from 1m to 4.8m) are conveyed to the finger jointing line. 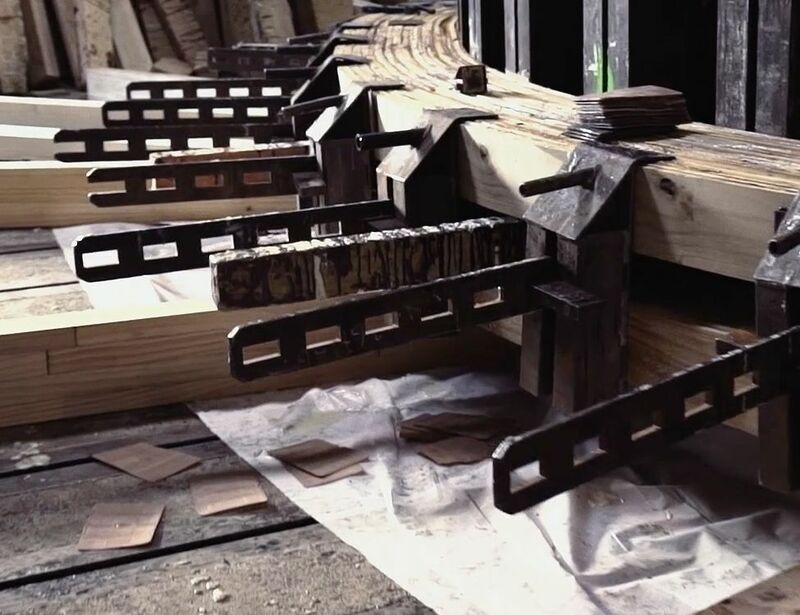 This machine cuts a ‘zigzag’ pattern in both ends of all timber pieces, then applies structural adhesive to the ends of each piece and clamps them together. From the finger joint press onwards the timber is transformed into a continuous length. A chopsaw then cuts the continuous length of finger-jointed timber into lengths according to whatever beam length is specified. The finger-jointed timber is then fed through a four sided planer and transferred to the glue line. Each stack will contain the timber required to make one beam. The glue line draws each piece of timber through the adhesive spreader at a set speed to maintain a consistent coverage of adhesive. Upon exit of the glue line, the timber is transferred onto the press beds. The clamps are tightened using hydraulics. These clamps can be arranged to produce curved or straight beams. After curing, the beams are removed from the clamps, placed on a roller table then fed through another large four sided planer to machine them to their final dimensions. The product then moves through into the finishing area, where they are finished, sanded and detailed according to the client’s requirements. Once the product has been finished, it is coated with a single coat of water based factory sealer for protection during transit and installation. It is then wrapped in protective plastic and moved to dispatch for shipping. Some helpful downloads on our products, processes and certifications. Chain of Custody certification issued by the FSC® (Forest Stewardship Council).